A bit of reading around the subject suggests that the disease can be very variable, and incredibly hard to diagnose with confidence. This variability needs to be understood before drugs to treat Alzheimer’s can be developed. This month, a couple of new pieces of research have been published with delve into the complexity of the disease – and produce some hopeful results. Before we get into the nitty gritty, let’s start with the basics – when someone gets Alzheimer’s disease, what exactly happens? It is complicated (isn’t it always!) but, in brief, scientists think that unwanted proteins collect in the brain, and get in the way of the day-to-day business of the millions of neurons that talk to one another to create memories, compel muscles to move, and generally keep us thinking and functioning. When the neurons can’t communicate with one another properly, they begin to die, resulting in gradual decay of the brain. 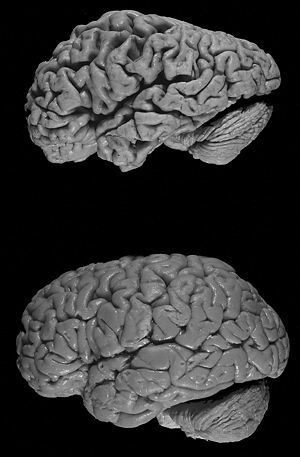 If you compare the brain of someone who died from Alzheimer’s with that of a normal person, the diseased brain is noticeably smaller. It’s also full of clumps of protein, known as plaques, which are the hallmarks by which doctors confirm that their diagnosis of Alzheimer’s was correct – it’s impossible to be completely certain until the patient has died and their brain examined. In extremely general terms, the more plaques there are, the more severe the Alzheimer’s disease is. The big questions for scientists are: what proteins are causing the neurons such difficulties, and why do they collect in the brain in the first place? The hottest contender is a protein called β-Amyloid, which is what the plaques in the brains of Alzheimer’s patients are made of. But, one complicating factor is that the plaques themselves are not necessarily the bits of β-Amyloid that are doing all the damage – in fact, they’re probably too big to get in between communicating neurons. Instead, experts think that smaller bundles of β-Amyloid protein are the most likely cause of Alzheimer’s, and that their formation is linked to that of the plaques. So, the theory goes, the more plaques there are, the more smaller β-Amyloid bundles there are, and the more problems there are with neuronal communication. So, that’s the not-so-basics covered. On to the research. One of the reasons that it’s so hard to understand Alzheimer’s disease is that, like many brain disorders, it’s extremely complex. As I mentioned before, people can present with a wide range of symptoms. The disease progresses much faster in some people than in others. Why does this variability occur? This month, scientists published data in the journal Cell which suggested that the answer to this question might lie in the structures formed by β-Amyloid protein. The researchers studied the β-Amyloid proteins from the brains of two people who had died of Alzheimer’s disease, named patient 1 and 2 for the purposes of the study. Although post-mortem showed that there were many β-Amyloid plaques in the brains of both patients, the two had presented with very different symptoms – so different, in fact, that patient 1 had been wrongly diagnosed with a different type of dementia, rather than Alzheimer’s disease. The scientists extracted strings of β-Amyloid protein – called fibres – from different areas of the brain of each patient, and grew them in petri dishes. They used specially developed imaging techniques to look at the fibres, and found that the β-Amyloid taken from the two patients looked noticeably different. The fibres from patient one grew in straight lines, whilst the fibres from patient two appeared to twist at regular intervals. However, despite the differences between the two patients, there was no variation within the brain of each indvidual. So, the fibres from patient one grew in an identical structure no matter which part of the brain they were taken from. The same was true of patient two. This is really interesting because, although scientists already knew that β-Amyloid could take on lots of different shapes, it was assumed that it would take on these different shapes in each brain. This would mean that the protein could be acting to disrupt neuron communication in many different ways in one patient. If β-Amyloid fibres are in fact uniform throughout each brain, it could make treatment of Alzheimer’s disease simpler. What’s more, the researchers believe that the imaging techniques they’ve developed for this work could be important in the diagnosis of Alzheimer’s disease. By using imaging to study what β-Amyloid structures are forming in the brain, in the future it might be possible to determine what treatments are likely to work best on each patient. This work could provide an exciting step forward, although it’s important not to get carried away – the results are extremely preliminary. By comparing only two patients, it’s impossible to get an idea of how variable β-Amyloid structures might be in the whole population of people with Alzheimer’s disease. It could be that these two patients were unusual, or that so many different structures of β-Amyloid are found that it is impossible to design different treatments for them all. But the work does provide a great jumping off point for further studies. This is all well and good, but there are still very few treatment options for patients. If we are to start thinking about how to treat Alzheimer’s, it’s important to know not only what the structure of β-Amyloid is, but also how it works. To do this, we need to understand what signals go wrong in the cell when β-Amyloid gets in the way of its normal function. Scientists from Stanford University have uncovered a possible explanation, in the form of a protein called LilrB2. LilrB2 is a member of a specific group of proteins called receptors. Receptors span the outer surface of cells, with part of the protein protruding outside the cell, and part on the inside. This makes them ideally placed to act as gateways for signals coming into the cell. In general, the gateway is normally locked shut, and only proteins of a specific shape can unlock it, by binding to the receptor – similar to a key fitting into a lock. This process is called activation. When activated, the receptor transmits signals across the surface of the cell, from outside to inside, instructing the cell to change its behaviour – maybe to divide, or die, or to change the structure of its outer membrane, for example. The researchers, publishing in the journal Science, found that β-Amyloid can bind to LilrB2 (and to the equivalent protein in mice, PirB) on neuron cells to activate them, causing the receptor to transmit signals into the neurons that are not normally transmitted in brain cells. The next step was to investigate whether β-Amyloid-LilrB2 (or β-Amyloid-PirB) binding was important in Alzheimer’s disease. The researchers took a strain of mice that make extra β-Amyloid and show symptoms of Alzheimer’s. They then deleted the gene that makes the PirB protein in these mice. They found that, while mice of this strain with fully functioning PirB protein had problems with memory loss, the mice that couldn’t make PirB had normal learning and memory skills. So, PirB is responsible for the symptoms of Alzheimer’s seen in these mice. Finally, the group went on to show that when PirB was activated by β-Amyloid, it was in turn activating a protein called Cofilin and that this ultimately resulted in changes in the structure of the cell. This is likely to be what causes the breakdown in neuronal communication in Alzheimer’s disease. These results are exciting because they suggest that drugs that stop LilrB2 transmitting signals to Cofilin might be a good treatment for Alzheimer’s. But of course, it’s not that simple. If β-Amyloid binds to LilrB2 and LilrB2 alone, you would expect that if you stopped cells from making the receptor, β-Amyloid would no longer be able to bind to the surface of the cell. When the researchers performed this experiment, they found that the amount of β-Amyloid on the cell surface was reduced by about half in cells with no LilrB2, but there was still some β-Amyloid present. This tells us that β-Amyloid is likely to be acting through more than one receptor, and so causing transmission of more than one unhealthy signal. In fact, several other receptors have already been implicated in transmitting β-Amyloid signals. Can we put the results of these two pieces of research together? On the one hand, we’ve seen that the very nature of the β-Amyloid proteins causing neuronal damage in Alzheimer’s disease can be different in different patients. On the other, we’ve seen preventing activation of the receptor LilrB2 might be a good way to prevent neuronal damage, but is unlikely to be the only important protein to target. Could it be that different β-Amyloid structures bind to different receptors on the cell surface? The researchers from the first paper found two different structures in two different patients. The second group of researchers used yet another type of β-Amyloid protein when performing their experiments. So it certainly is possible that the structure of β-Amyloid determines which receptors it will bind to. This is a big leap, and a lot more research would be required before we could draw this sort of conclusion. However, it could be that these breakthroughs together will help us to begin to get a grasp on how to combat Alzheimer’s. This slideshow provides a really great explanation of how Alzheimer’s affects the brain, and the basics of how β-Amyloid and other proteins might be involved. This entry was posted in cell biology, science and tagged Alzheimer's disease, Beta amyloid, Dementia, medical breakthrough by allinthegenes. Bookmark the permalink. very timely – today there is a cure! Actually very good to hear the scientist involved say that it was not a drug, just a molecule with serious side effects, but still it’s a new hope (as the star people say).